With the thousands of web hosting companies in existence, choosing a suitable plan can be a long and time-consuming decision. 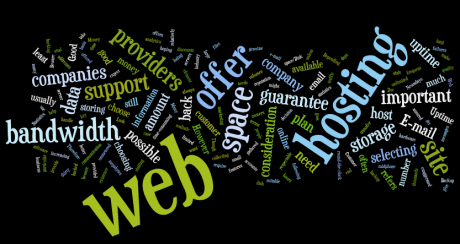 The following are some things that you need to take into consideration when selecting a web host. This refers to the amount of storage space provided for storing your web files. Nowadays, web hosting companies offer disk space in terms of gigabytes, though there are those still offering storage space in megabytes. Depending on your storage needs, you might require more or less space. When selecting a hosting plan, the amount of bandwidth offered is a very important consideration. Generally, it is better to choose a company which offers you as much bandwidth as possible. A large bandwidth will enable you to handle increasing volumes of traffic to your site. However, you need to beware of web hosting providers who offer unmetered or unlimited bandwidth. Though some could be genuine, there are those who have exaggerated their bandwidth hoping the customer won’t use much. The quality of customer support is a very important consideration when choosing a web host. Many web hosting companies offer round-the-clock support in case you need any help with your site, while some are only available at particular hours. This means that if your site goes down at a time when you can’t get support, you will end up losing business. Therefore, make sure you choose a web host who will always be accessible for support. This was one of the key considerations when selecting a web hosting plan for my site, which features ANhosting discounts and midphase coupons. Most web hosting providers offer a money back guarantee of at least thirty days or more. Beware of those who don’t give a money back guarantee, unless they have a good reputation and are a respectable leader in the industry. Good web hosting providers usually have a frequent schedule for backing up data. It is important for data to be backed up as often as possible on web servers. If possible, find web hosting providers who backup data on a daily basis. E-mail is a vital element of communication online. Most web hosting providers offer many e-mail addresses as well as space for storing email messages and E-mail marketing campaigns. Look out for those who offer a limited number of email accounts or a small storage space. Uptime refers to how often a hosted site is available online. Due to unavoidable circumstances such as software, hardware or power failures, it is not realistic to expect any company to offer 100% uptime. However, it is still important to be assured of a relatively good uptime. Find a company which will guarantee you at least 99% uptime. As a web owner, you would want to have statistics such as the number of people visiting your site, where they came from, the amount of bandwidth they used and the duration of their visit: Web analytics. This information, which is usually gathered by the web server, can provide useful information for web owners. Good web hosting companies will offer an efficient way of collecting such data. About the author: A writer with a particular interest in sharing blogging tips, Charles Mburugu also writes about special coupon and discount offers such as midphase discounts and ANhosting coupons. He currently writes for a coupon blog that offers ANhosting.com coupons and midphase.com coupons. I’ll definitely take note of these tips you have listed. I know a lot of web hosting companies and it is hard to select the best one that’s why I needed this kind of advice in order for me to choose well. I don’t have any idea what to consider when choosing a web hosting company. Thanks for this information. Now I know how to select the best one when it comes to web hosting. I agree with you. There are web hosting companies that do not give customer support. They will tell you to send your inquiries through e-mail but it will take too long before they will respond.